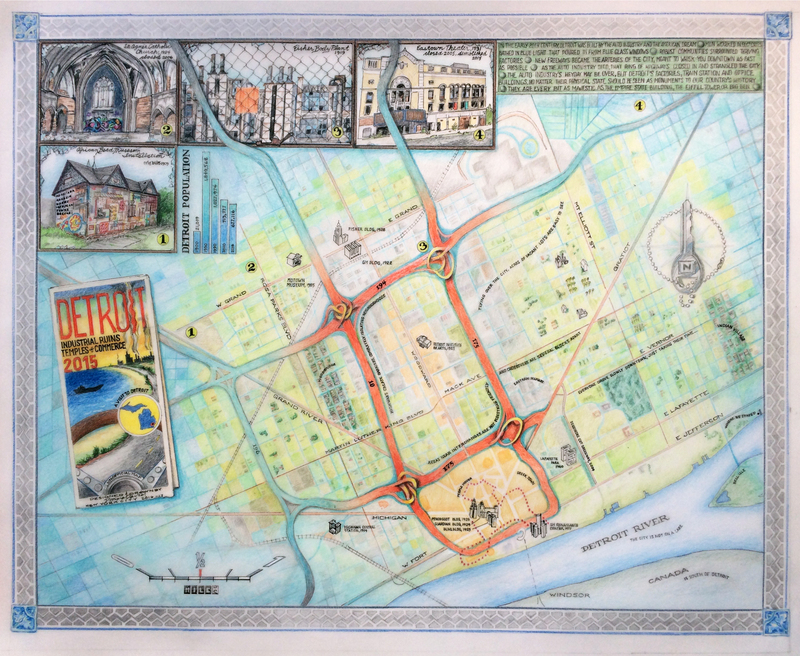 The American Geographical Society is pleased to present this month’s Map Contest winner Donna David and her map entitled “Detroit: Industrial Ruins, Temples of Commerce.” The AGS chose this map due its artistic style, creative freedom, and unique function as a map. Not all maps need to be data-driven and information dense. Some can document personal and emotional journeys experienced from a certain perspective. Donna David’s map illustrates all these points beautifully. To describe the artistic and creative process behind this map, the creator herself has written the following description. “I created this hand-drawn map to commemorate a visit I made to Detroit in 2015. Detroit’s long-closed factories, buildings, and neighborhoods are America’s ‘cathedrals’ and monuments to American history. Maps always have a point of view and this map is a record of my overall impression of what I saw and also felt during that visit. “When considering the design of the map, I was inspired by my recent research of old maps in the New York Public Library and the American Geographic Society collections at the University of Wisconsin. Using architectural and automobile motifs, and the authoritative language of old maps, with a twist, I tried to capture the city as I experienced it. This can be seen in the highway map cartouche (inspired by an actual 1947 Michigan state map), ignition key compass rose, and car tire tread and Pewabic pottery border. “During a visit to the abandoned Fisher Body Plant 21, the light inside struck me. Everything had a beautiful soft blue hue from the light coming in from what was left of the original blue glass in the windows. Apparently, Ford thought that blue light would have a calming effect on the workers. I bathed my map in this blue, to represent the auto industry encroaching on the city. “Beyond the derelict factories and crumbling churches, are acres and acres of what used to be thriving residential neighborhoods. As the auto industry declined, people moved away. Houses were left abandoned for one reason or another, fell into disrepair, and were “scrapped” for metal and other valuable materials. From the air, as we approached the airport, the empty blocks made a patchwork that reminded me of Midwestern farm fields, as depicted on the map. “Lastly, when studying a current Detroit map during the visit, I was taken with how the freeways seem to strangle the city and cut off one neighborhood from another. I created nonsensical knots at the interchanges, to give a sinister quality to the freeways.